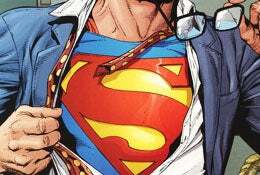 It's June 30th, DC Comics' official birthday for the Man of Steel, whose first appearance occurred seventy years ago this month in the first issue of Action Comics. It's true that DC has avoided making a big deal out of Superman's 70th birthday for some reason, but let's take a look and see what they've been doing inside the comics to celebrate. Superman appears across multiple series in DC's line, from Justice League of America and Trinity to the kid-centric Superfriends and Justice League Unlimited. But each of his three solo series must've done something to commemorate this rather momentous anniversary, right? Superman: At least it seems as if he's taken the day off in the first issue of new writer James Robinson's run, hanging out in space with Green Lantern, playing super-frisbee with Krypto the Super-Dog before disaster calls. But where's Lois with his birthday present? Are the rest of the Justice League planning a surprise party while all this is going on? Man. That's just cold. I know it's meant to be a "never-ending battle," but still. It wouldn't have killed you guys to give him a card or something.